Nico Mastorakis' (Hired to Kill) Death Street USA aka Nightmare At Noon is heading to Blu Ray in March 2018. Yea, I know that's a long ways away, but it's never too soon to get the scoop on some killer new releases, right? Amazon already has a link up to put your pre-order in HERE, but like I said, you'll be waiting until March of next year until you get your hands on it. I've never actually gotten to see this one yet, but it's been on my radar for a while now, ever since I saw Hired to Kill (1990) this past year. I'm a huge fan of that film starring Brian Thompson and Oliver Reed, so I'm stoked to check this one out, and hoping it's as good, or at least as entertaining. 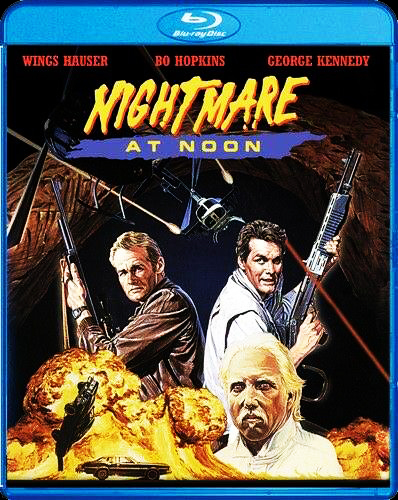 Released in 1988, Nightmare At Noon stars Wings Hauser, the late great Brion James, George Kennedy and Bo Hopkins, and centers around mad scientists who poison a small towns water supply, turning the residents into homicidal maniacs. Doesn't that sound amazing?! Having not actually seen it myself, that's really all I can tell you. And the new Blu Ray release is a mystery at this point. I heard it was coming from Shout! Factory, but then the Amazon listing has the studio listed as Cinedigm. And I can't find any other official info at this time, so unless someone points me in the right direction, we'll just have to sit tight and wait for any further updates. If I hear of any, I'll be sure to update you as soon as I know.